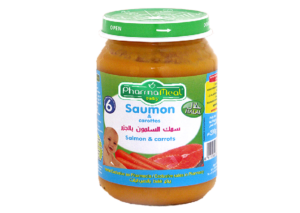 Discover this small salmon baby jar with mashed carrots. A delicious mixture rich in flavor that perfectly introduces your baby to the good taste of the fish. The carrots helps prevent from digestive problems and is also excellent for dental health disorders. A nutritious meal to awaken the senses of your baby from an early age.